Who?-In a nutshell, I'm a master mechanic and one of the Automotively Insane. I went from wanting to do an LS swapped FD RX7 to starting an LS swapped Impreza to maybe doing a tube frame monster MGB GT to this, my current AI pregnancy, which I will be carrying to term. 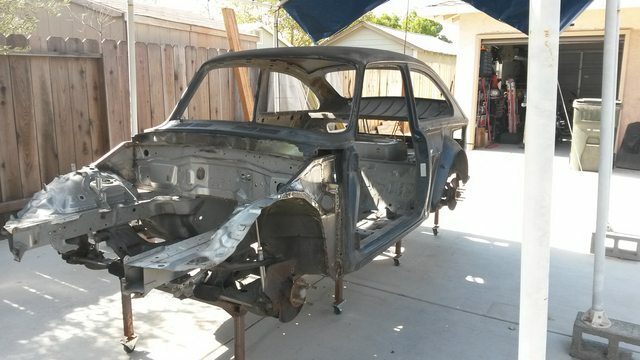 What?- I am currently dropping the body of a 1968 VW Fastback onto the stripped down chassis of my 2000 Miata, titled and driven as a 1968 VW. Engine will be a 2.4l Ecotec because reasons. When?- By the end of summer 2019, I hope. I started tearing down the Miata in August 2016 and the VW a couple months later. 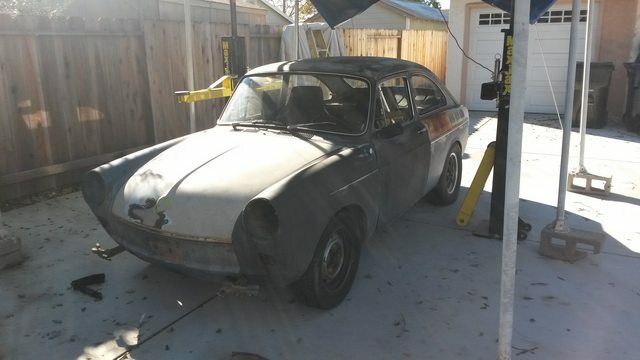 Why?- I wanted something unique, cool, smog exempt, daily driveable, and actually able to be completed on my own in my back yard for minimal monetary investment. Where?... did the idea come from? A DMT trip. No, it was actually a long spiraling journey a couple years in the making that came from the above stated goals. How?- A 4.5" grinder, a welder, a 2 post lift, and good old fashioned know-it-mostly. I will attempt to paint it myself as well. Jeebus help me. This is basically a copy of a thread currently running on SomethingAwful's Automotive Insanity forum. All pics will be dumped on Instagram #volkzda. Why do all this? 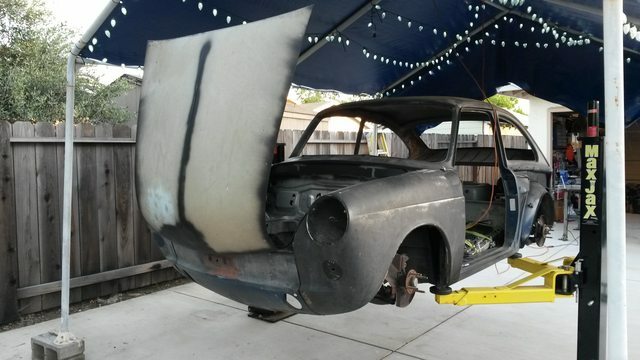 Why not build up the Fastback? I had reached the limit of what I wanted from the Miata and was going to sell it. I had strongly considered just getting a C5 Corvette or some 1995 car to drop an E-Rod in but I never felt fully gung-ho about any of those ideas. 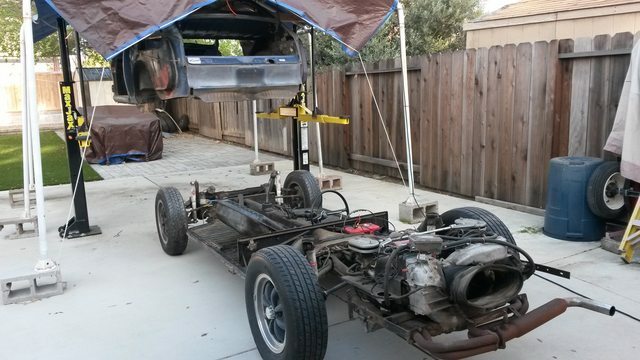 From there I came up with the idea of using the Miata suspension in an older (pre '75) car and dropping in whatever I felt like for the drivetrain. 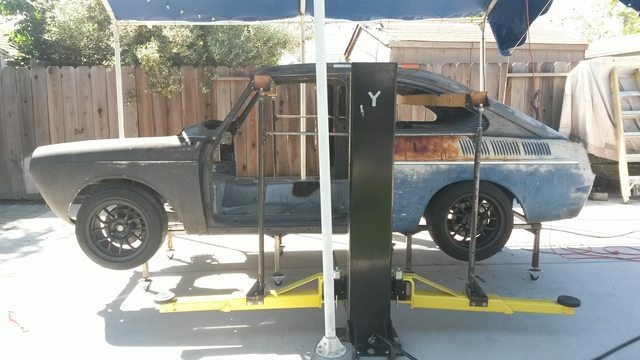 But I thought more about daily driving capability and safety and decided, after seeing the Volvo P1800/Miata project, to just go ahead and use the whole chassis in something. 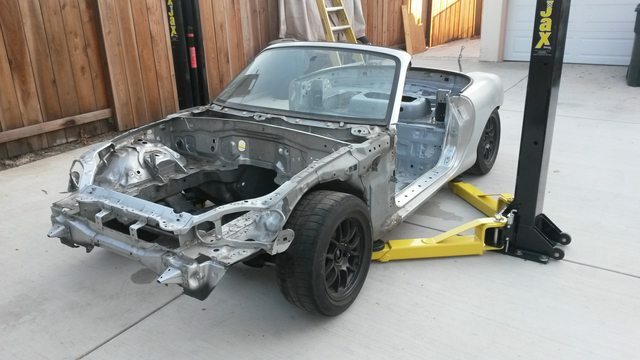 Miatas are automotive blank canvases for swaps and performance stuff anyway. From there I settled on the VW Type 3 due to it being fairly close in size to a Miata but roomier and with a lot of aftermarket resto support. I really wanted to do this with a Datsun 510 but no way I'm going to pay $8000 for a clapped out POS that needed body work. 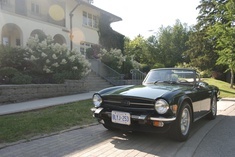 I also considered an MGB GT but I already felt claustrophobic in the Miata. I never considered building up a classic car to daily drive. What about the paint? Some sort of dark metallic gray/silver. 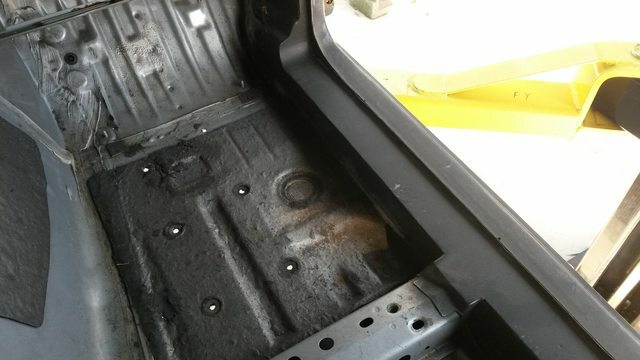 Interior will be the same above the floor while every other surface will be satin black. Why the Ecotec? The M45 supercharged, intercooled 1.8 that I had was in decent shape and I was going to just use it but there are issues. Heat buildup is always an issue with these and having a supercharger and intercooler makes it worse. I was unable to use A/C on hot days in traffic. Not good. Power was decent, maybe 170whp 150wtq, maybe, before everything heat soaked. The LE5 Ecotec swap will add about $3000 to this project but will come with about 190whp 190wtq or more and no heat problems. It will also be better with my 3.63 rear gears that I wish I hadn't done a few years ago. Also, since getting the nose back on the car I realized that there isn't enough room for an intercooler and I'd rather not have to come up with alternatives. Why not keep the classic VW dash? 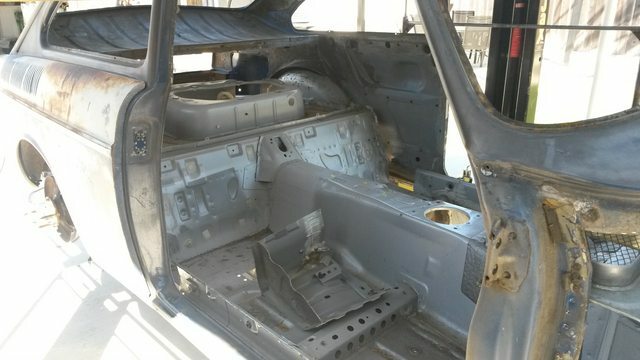 I'm using the Miata HVAC and airbags, the forward firewalls are just too different for that to work. Plus, the VW dash is crammed up against the windshield and sits much higher than the Miatas. LS1 Impreza you say? 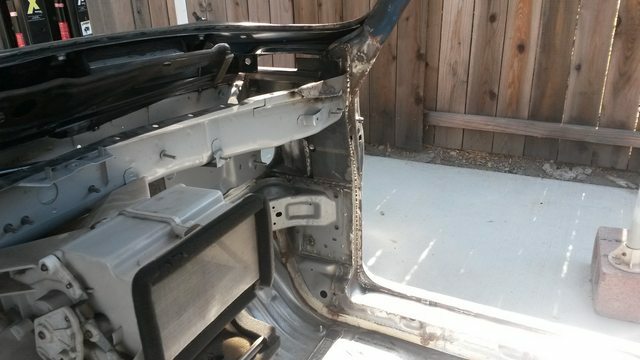 10 years ago I had a late 90's era Outback Sport that I was dropping the guts from a wrecked 02 Camaro into. It was going to be done STi style, black or dark gray and murdered out, with the quietest exhaust I could fit. I was working on it at the shop where I was employed but I got a new job and moved 30 miles away so I had to part it out and move on. 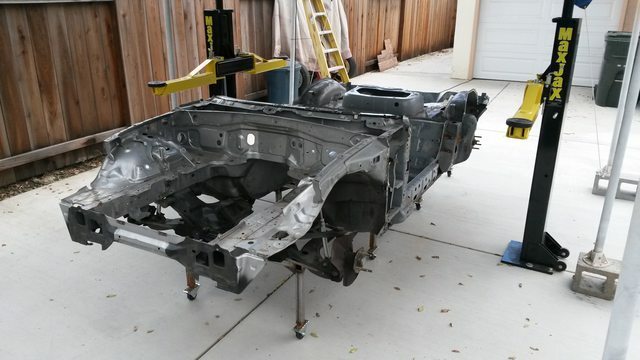 I started by taking everything off of my Miata that was bolted on or was otherwise easily removed. I was going to just sell this thing and use a tub but it really wasn't worth that much and everything I needed was already there. Next I started trimming down any parts that I knew wouldn't fit inside the VW body. The chassis sits on a jig I made out of 1.5x1.5 steel tube with adjustable casters to level it out. The whole thing is true to about a tenth of a degree in any direction which is damn good considering. 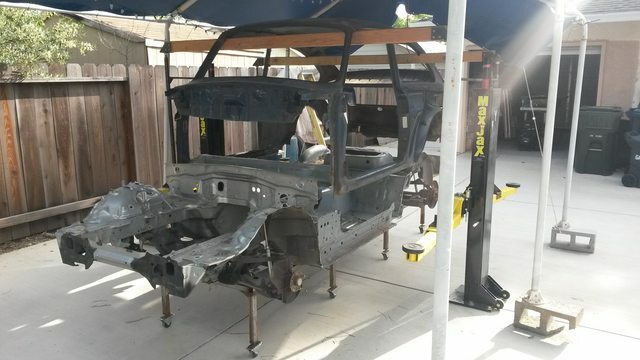 The rear portion of the chassis is held up on cross pieces that were allowed to slide backwards while the front was tack welded to the jig. 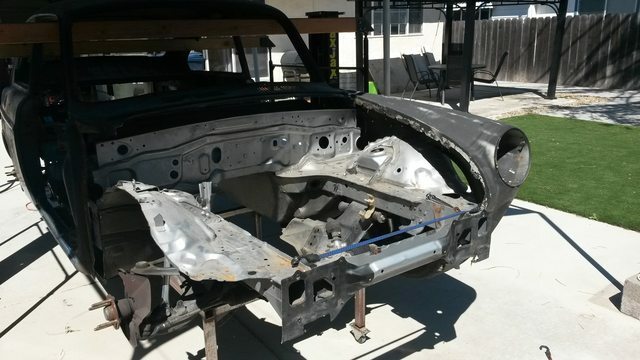 The wheelbase of the VW is around 5.5" longer which required a stretch of the Miata chassis behind the seats. Separating it here is by far the easiest spot. The next victim, after I had removed a bunch of stuff. 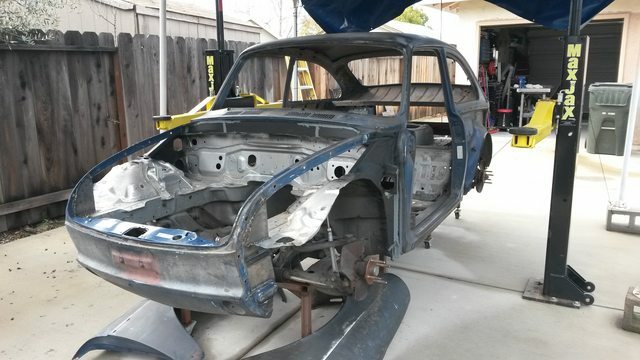 1968 VW Fastback with a salvage title and a bunch of extra parts including another pair of rear fenders. Had a Porsche 914 engine swapped in at some point that recouped me some decent money. The mostly clean pan and drivetrain came out, along with every bolted on part. The cheap 70's era replacement windshield broke as it was being removed. Luckily there are replacements available, a big reason why I decided to go ahead with this project with this car in the first place. Test hovering and measurement time. All I did to make the lifting rig was used some steel tube with a plate base bolted to my lift's arms. Some wood 4x4s with grooves cut into them formed the cross beams, the ends of which rode on threaded rod to be able to level them. After much cutting from each half, another test hover. 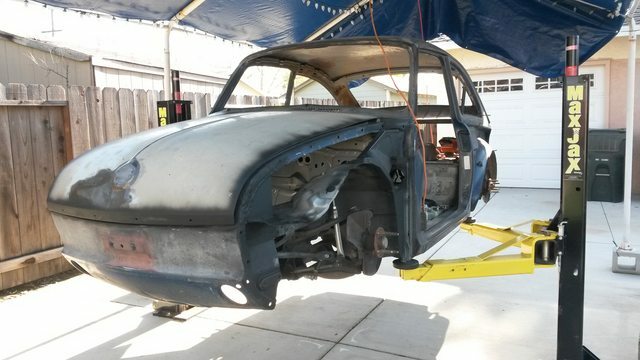 The nose had to come off of the VW due to the way the nose tucks under. There was no other good way of being able to raise and lower the top half a million times otherwise. Most cutting finished. Body lowered over the chassis with the fenders and wheels put on to gauge fitment. I stood and stared at this in awe for an hour. Good amount of room under the hood. I was feeling pretty good with this but realized that there probably wouldn't be enough room for the intercooler I had from the Miata. 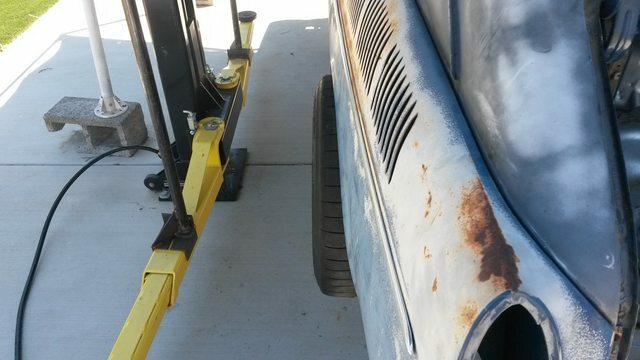 The front bumper bar and frame horn tips had to be cut back to fit within the VW nose. Feeling real good now. The interior looks to be exactly what I had figured it should be like. The a-pillar/wiper cowl/door post area not so much. I knew that that would be the worst area to work with though but man. Wheel fitment with rotors on the hubs. Suspension is drooped a little bit in front and a lot bit in rear. Front will need 1" flares minimum and the rear will need 2" minimum along with a decent raising of the arch. I'm not sure what sort of flares will be going on here. Something easy, bodywork isn't my forte and I ain't paying for custom body work. The cutting is totally done and the welding has begun. The name of the game from here is to connect things together with sheetmetal and reinforce structure with bar, plate, and tube. I missed taking pics of a lot of fab work to get to here but the highlights are that I basically had to build the structure for the front fender/shock tower area out of tube and plate and that there is a continuous run of 1x3 rectangle tube running through the sills and up the firewalls to form the main attachment base between the two halves of car. Interior being stitched together. Never mind the ugly patchwork. The VW body was worse than I thought around the rear wheel arches. All of this will be reinforced and/or covered eventually. The lower front portion came together nicely. Closer shot of the new sill caps for the much shorter chassis sills. The seam is literally where VW meets Miata. The "funnest" part. Due to the vast difference between the two cars the cowl area was the most difficult to deal with but I managed. I had to make the center dash/cowl section removable to be able to access the wiper system and cowl vents. I had to do it from the inside because there wasn't enough room from the engine bay side. I will probably make some sort of beauty cover for this later. 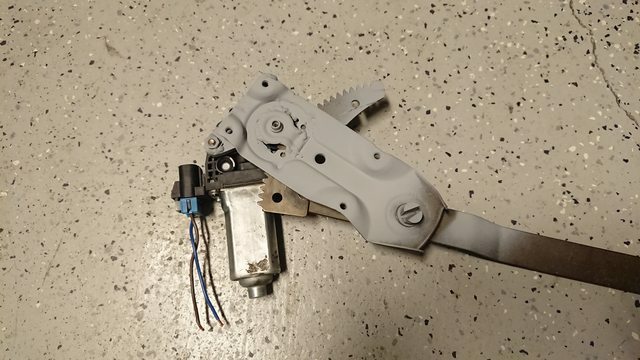 The Miata wiper motor will drive the VW wiper arm setup via a custom attachment link. Chassis jig has done it's job and is no longer needed. Engine side of cowl closed off. Nose beginning to be stitched back on. 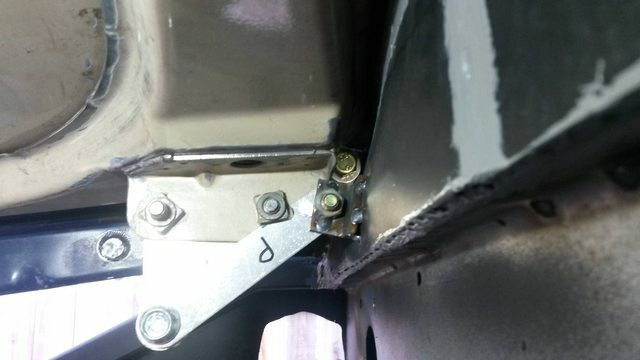 The VW bumper mounting points are connected to the Miata frame rails with sheetmetal. 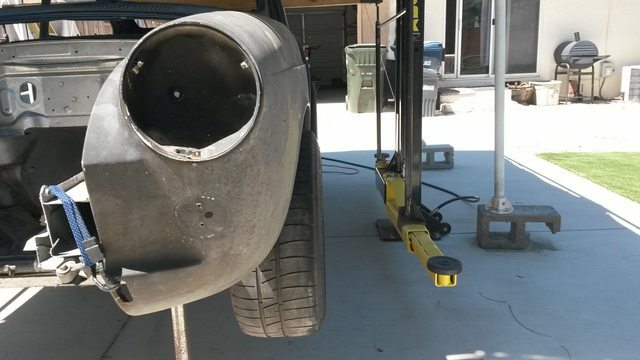 Front and rear structural crash bars tied to the Miata frame horns. The nose ended up being a bit more cramped than I had anticipated. As you can see the rear is quite roomy and will make for a larger trunk, this will all be boxed in. The bars have long 3/4" hex nuts welded into them to attach tow rings via holes that will be hidden behind the license plates. The Miata dash just sitting there. I'm going to be using it but getting it to look less awkward will take some doing. As of April 2018 this is how it sits. This is the point where I put the front fenders and wheels on for the Jalopnik beauty shots. 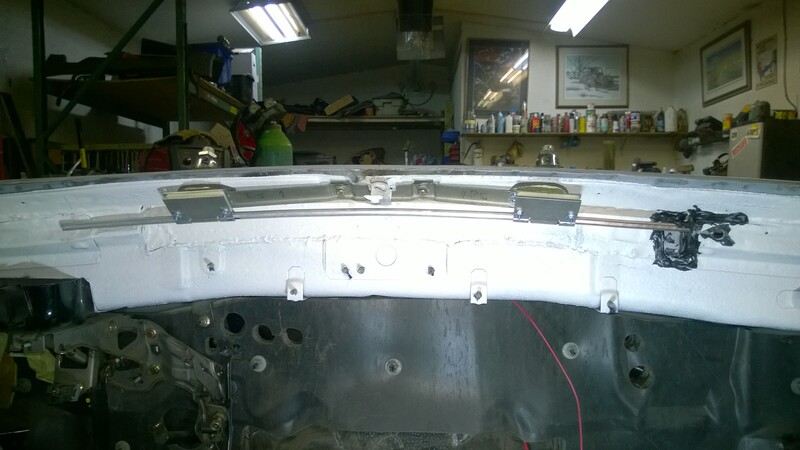 I will be making custom hood hinges to bolt the hood to as I cannot use the VW hood hinge setup. I'm also working on filling in the trunk/rear area. Miata power antenna installed near the original VW location. Trunk boxed in. Custom fabbed forward tilting hood hinge setup installed, almost exact same as this one, http://www.halosupercars.com/blog/the-work/camaro-reverse-tilt-hood-kit/. Washer fluid reservoir in/near passenger fender so that you can fill it through the VW fuel door. Rear firewall fabbed with a fuel tank access panel. 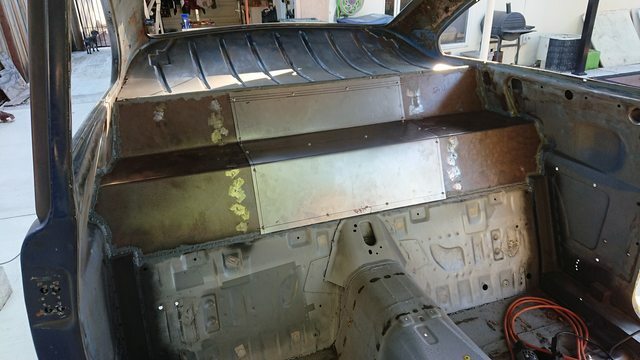 Upper radiator mount/air duct panel. 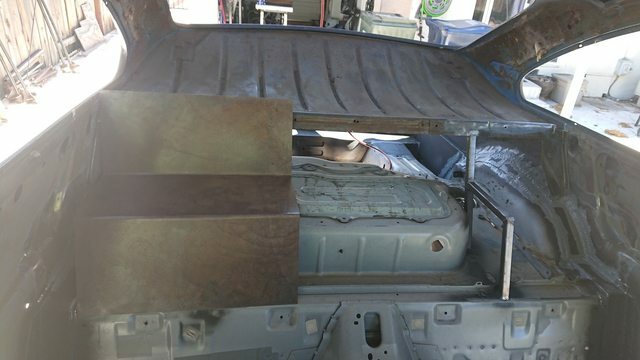 The lower radiator and condenser mounts were chopped off the Miata brackets, welded to some box tube, and welded to a crossbar that I welded into the bottom of the cars chin. 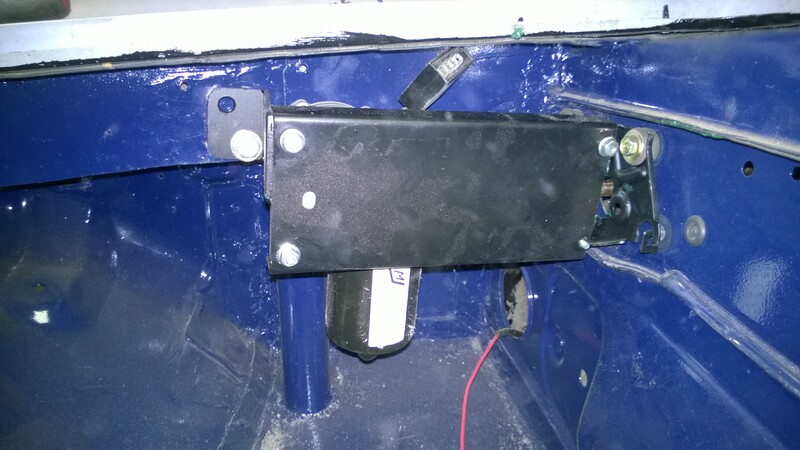 Ion power window motor grafted onto VW regulator. The corner of the Miata dash covers the window crank so I just had to have power windows. My mocked up SLA hinges (that don't work). You can see the two pivot points on the firewall. 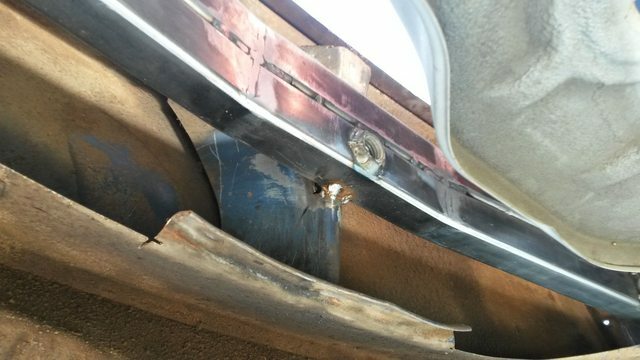 The hidden arm jogs down and over to the front hole of the hood bracket. The idea is to use an SLA setup to trade a bit of tilt for lift, just can't get enough of either, just barely. 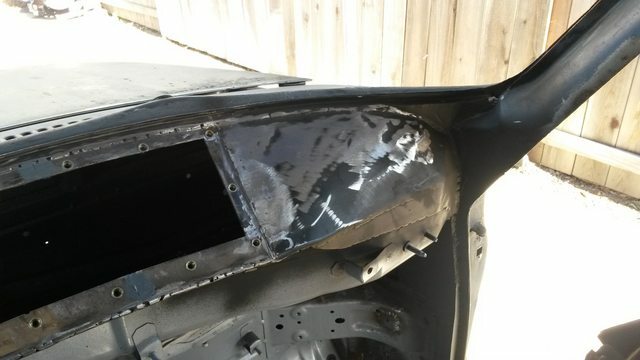 The rear corners of the hood hit the cowl at about half way open. I don't know what to do now. Have it hinge at the front? Why yes, that's what I'm working on now. It'll be way more sick tight yo. Going through the pictures is kind of surreal. You were my main inspiration to go ahead with this madness! It's your fault. I'm not giving as much attention to detail as yours or Project Binky or something but rest assured that this will be my daily driver, with all the comforts. You had me at "fastback." My wife does claim that the only reason I am not totally useless is because I can be used as a bad example. Thanks for validating her point! 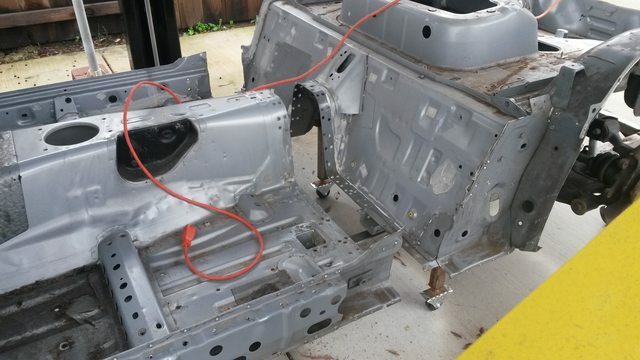 The whole project has confirmed my thoughts about the benefits of welding classic tin swapped on to modern chassis. It has also taught me that doing a simultaneous wheelbase stretch AND an engine swap is extra work and expense that might have been avoided. A P1800 ES with a stock Miata 1800 would have been fine for the wife-unit and saved $10k and a couple of years of time. But what fun would that be? You are correct that the firewall integration is the fun bit. Lot of thought should go into that area if the result is going to be civilized.The more of the modern car you can use the better in my opinion. Have you sat a seat in the car with the dash about where is is going to be? I think that your seats are going to have to be raised along with the dashboard will have to go higher. Not a big deal as you seem to have room. 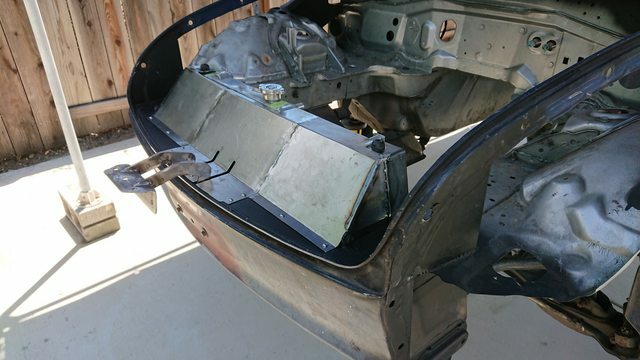 Raising the dash is no big deal until you want it to still work with the Miata HVAC. If you raise the dashboard, the vents will no longer line up with the HVAC plant that is so nicely bolted into the factory location. I REALLY wanted all that stuff to be stock Mazda. You mention keeping the airbags...airbags scare me in their own right. Both working with then during the build and having them deploy in an environment where they were not intended for. Same thoughts for the anti-lock brakes. So both of those are deletes in my project. Wipers were a pain. Tried a lot of things, but in the end the kit from specialty power windows solved all of my problems. I love this! Excited to see the outcome. 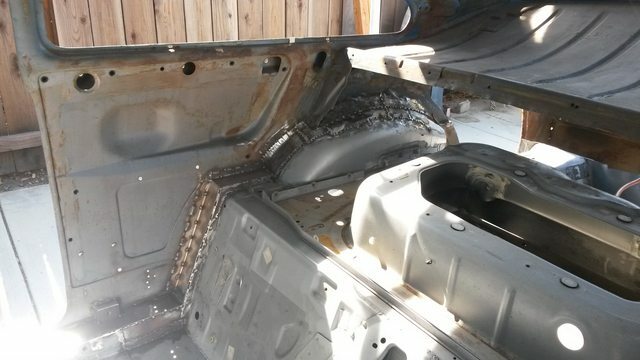 I’ve been considering doing a floor pan swap for my next project and this has confirmed it for me! Thanks. Awesome stuff. I hope jalopnik doesn’t get a hold of Darth Nader partway through the build, I don’t move fast enough to keep updating things. All I did for the wipers was remove the VW motor (because it didn't fit), welded the arms together, added another pivot to one of the VW arms in just the right spot to maintain the proper throw, and stretched the stock Miata wiper link to reach. I even tested it in the car. Didn't take any pics then but I will when I go to put it in for good. I will be using all of the Miata HVAC so the dash will stay in the "Miata" position. You are correct though that the seating position and dash will be lower because of the higher cowl. I'll probably come up with a custom made dash topper that blends it together a bit. I will probably get different seats because I performed the classic foamectomy on the driver's seat. As for the airbags; I'm going to use them because they are valuable safety equipment. I'm a master mechanic so I'm not really worried about handling them or setting them up properly. 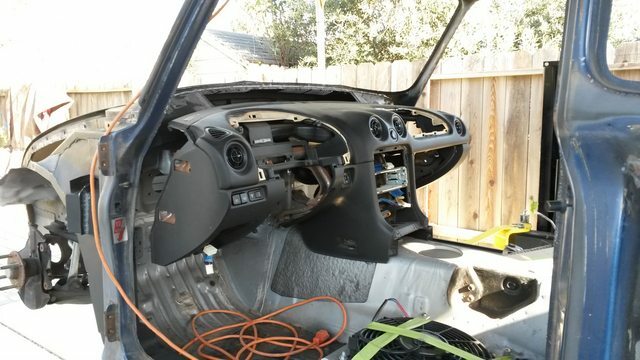 This is also a very good reason to use the Miata dash in it's proper location. I'm waiting for my seal and rubber kit to show up before I go any further on my front hinging hood. So in the mean time I put the Miata's power antenna on the VW fender and patched the original antenna hole. Yeah buddy! Who's got a forward opening hood, a power antenna, and two thumbs? This guy. 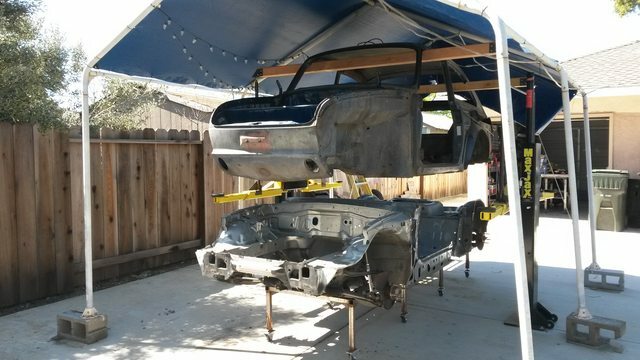 The way I'm doing it is basically the exact same as this,http://www.halosupercars.com/blog/the-work/camaro-reverse-tilt-hood-kit/ , but without the gas struts. I may end up putting struts in later though. A washer fluid reservoir will be going into or near the passenger fender so that I can fill it through the VW fuel door. I've been doing a multitude of little things that don't really warrant individual mention. Biggest thing right now is the rear firewall. The outer 1/3 portions will be made to match the side wall contours and be welded in and the center 1/3 will bolt in. I can't believe you're doing this under a friggin tent! You must live somewhere with nice weather like California. San Francisco bay area. The only days I don't work on it are rainy days. Wow, nice job. This looks great! Is there a rason you did away with the Mita seat-belt towers? 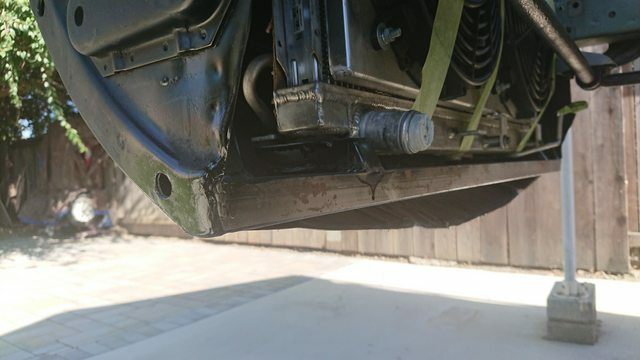 Due to stretching the chassis and having to put the upper guide/pivot on the VW b-pillar I decided to mount them near the floor below the b-pillar like most cars do. I've welded the mounting points and fit tested them already. I just haven't documented it yet. Rear firewall fabbed with fuel tank access panel. In the lower right corner you can sorta see the seatbelt mounting point. 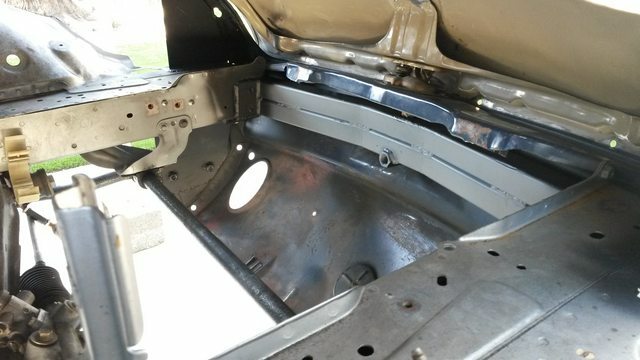 I transferred the Miata's original mounting nut to a chunk of c-channel and welded it right to the 1x3 inside the sill and boxed it in.